Poison Ivy:Found throughout the United States except Alaska, Hawaii, and parts of the West Coast. Can grow as a vine or small shrub trailing along the ground or climbing on low plants, trees and poles. Each leaf has three glossy leaflets, with smooth or toothed edges. 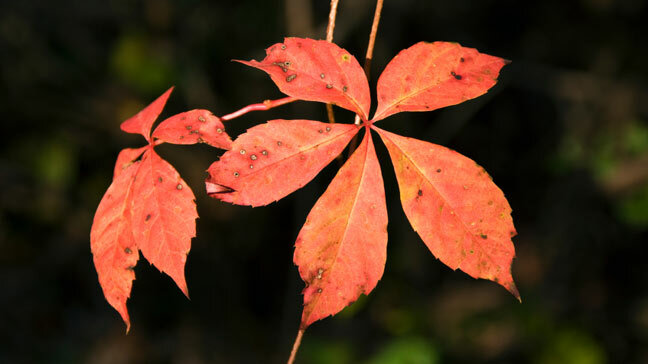 Leaves are reddish in spring, green in summer, and yellow, orange, or red in fall. May have greenish-white flowers and whitish-yellow berries. Poison Oak:Grows as a low shrub in the Eastern and Southern United States, and in tall clumps or long vines on the Pacific Coast. Fuzzy green leaves in clusters of three are lobed or deeply toothed with rounded tips. May have yellow-white berries. Poison Sumac:Grows as a tall shrub or small tree in bogs or swamps in the Northeast, Midwest, and parts of the Southeast. Each leaf has clusters of seven to 13 smooth-edged leaflets. Leaves are orange in spring, green in summer, and yellow, orange, or red in fall. May have yellow-greenish flowers and whitish-green fruits hang in loose clusters. Learn what poison ivy, oak, and sumac plants look like so you can avoid them Wash your garden tools and gloves regularly. If you think you may be working around poison ivy, wear long sleeves, long pants tucked into boots, and impermeable gloves.